Furlanetto, Elena and Dietmar Meinel, editors. 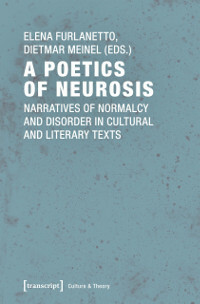 A Poetics of Neurosis: Narratives of Normalcy and Disorder in Cultural and Literary Texts. Bielefeld, transcript, 2018. While psychiatry and the neurosciences have dismissed the concept of neurosis as too vague for medical purposes, in recent years literary studies have adopted the term by virtue of its abstractness. This volume investigates the verbalization of neurosis in literary and cultural texts. As opposed to the medical diagnostics of neurosis in the individual, the contributions focus on the poetics of neurosis. They indicate how neuroses are still routinely romanticized or vilified, bent to suit aesthetic and narrative choices, and transfigured to illustrate unresolved cultural tensions (this volume is available as open access). Meinel, Dietmar. Pixar's America: The Re-Animation of American Myths and Symbols. Basingstoke & New York, Palgrave Macmillan, 2016. This book examines the popular and critically acclaimed films of Pixar Animation Studios in their cultural and historical context. Whether interventionist sheriff dolls liberating oppressed toys (Toy Story) or exceptionally talented rodents hoping to fulfill their dreams (Ratatouille), these cinematic texts draw on popular myths and symbols of American culture. As Pixar films refashion traditional American figures, motifs and narratives for contemporary audiences, this book looks at their politics - from the frontier myth in light of traditional gender roles (WALL-E) to the notion of voluntary associations and neoliberalism (The Incredibles). Through close readings, this volume considers the aesthetics of digital animation, including voice-acting and the simulation of camera work, as further mediations of the traditional themes and motifs of American culture in novel form. 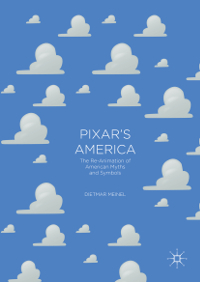 Dietmar Meinel explores the ways in which Pixar films come to reanimate and remediate prominent myths and symbols of American culture in all their cinematic, ideological and narrative complexity. Siepmann, Philipp. Inter- und transkulturelles Lernen im Englischunterricht der Sekundarstufe II. Frankfurt am Main, Peter Lang, 2016. Dieses Buch leistet einen Beitrag zur Debatte um eine transkulturelle Öffnung der englischen Kultur- und Literaturdidaktik. Es sucht dazu den Dialog mit den American Studies. Ähnlich wie in der Fachdidaktik hat sich hier mit dem transnational turn eine Revision der kulturtheoretischen Grundlagen vollzogen. Die Transnational Studies untersuchen Amerika im globalen Zeitalter verstärkt hinsichtlich seiner transnationalen und transkulturellen Verbindungen. 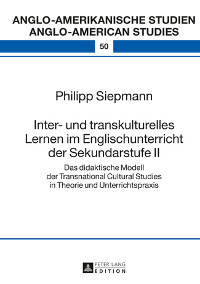 Basierend auf den Schlüsselkonzepten des Forschungsprogramms der Transnational American Studies sowie auf Ansätzen der Cultural Studies im Englischunterricht entwickelt der Autor ein didaktisches Modell zur Gestaltung inter- und transkultureller Lernprozesse der Sekundarstufe II (Transnational Cultural Studies). Sattler, Julia, editor. Urban Transformations in the U.S.A. Spaces, Communities, Representations. Bielefeld, transcript, 2016. How did American cities change throughout the 20th and early 21st century? This timely publication integrates research from American Literary and Cultural Studies, Urban Studies and History. 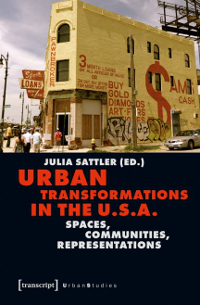 The essays range from negotiations of the "ethnic city" in US literature and media, to studies of recent urban phenomena and their representations: gentrification, re-appropriation and conversion of urban spaces in the USA. These interdisciplinary and intercultural perspectives on American cities provide unique points of access for studying the complex narratives of urban transformation. Freitag, Kornelia, editor. Recovery and Transgression: Memory in American Poetry. Newcastle, Cambridge Scholars Publishing, 2015. There is no poetry without memory. 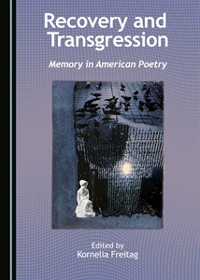 Recovery and Transgression: Memory in American Poetry is devoted to the ways in which poetic texts shape, and are shaped by, personal, collective, and cultural memory. It looks at the manifold and often transgressive techniques through which the past is recovered and repurposed in poetry. T.S. Eliot's "The Waste Land," Susan Howe's That This, Lyn Hejinian's Writing Is an Aid to Memory, John Tranter's "The Anaglyph," Amiri Baraka's "Somebody Blew Up America," and Amy Clampitt's "Nothing Stays Put" are only some of the texts discussed in this volume by a group of international poetry experts. They specifically focus on the effects of the cultural interaction, mixture, translation, and hybridization of memory of, in, and mediated by poetry. Poetic memory, as becomes strikingly clear, may be founded on the past, but has everything to do with the cultural present of poets and readers, and with their hopes and fears for the future. Freitag, Kornelia, with Brian Reed. Locating Asian American Poetry. Colloquy. ARCADE. Stanford University. Web. 17 August 2015. For the 2015 American Comparative Literature Association annual conference, the co-editors of this colloquy decided to organize a seminar with the purpose of exploring the state of the field of Asian American Poetry. What kinds of material are scholars choosing to write about? How do they imagine their objects of study, and how do they configure the relation between the three key terms Asian, American, and poetry? How do they deploy rubrics such as diaspora, nation, and migration? How do they define the relationship between race and aesthetics? We chose the title "Locating Contemporary Asian American Poetry" because so many of the questions we were asking involved charting spaces, providing timelines, and (re)discovering texts. We did not intend to fix or contain our subject matter, to pin it down or assign it a place; we wanted to generate and share impressions of and insights into a swiftly growing, changing area of study. This colloquy gathers together six of the papers presented at the 2015 ACLA conference, along with excerpts from two precursor texts, Timothy Yu's Race and the Avant-Garde (2009) and Dorothy Wang's Thinking Its Presence (2013), which provide literary-historical and literary-critical background. Buchenau, Barbara, Virginia Richter with Marijke Denger, editors. Post-Empire Imaginaries? Anglophone Literature, History, and the Demise of Empires. Amsterdam & New York, Brill|Rodopi, 2015. Empires as political entities may be a thing of the past, but as a concept, empire is alive and kicking. From heritage tourism and costume dramas to theories of the imperial idea(l): empire sells. Post-Empire Imaginaries? Anglophone Literature, History, and the Demise of Empires presents innovative scholarship on the lives and legacies of empires in diverse media such as literature, film, advertising, and the visual arts. Though rooted in real space and history, the post-empire and its twin, the post-imperial, emerge as ungraspable ideational constructs. 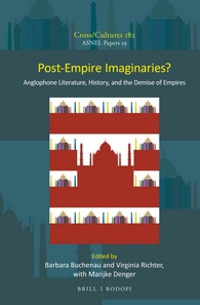 The volume convincingly establishes empire as welcoming resistance and affirmation, introducing post-empire imaginaries as figurations that connect the archives and repertoires of colonial nostalgia, postcolonial critique, post-imperial dreaming. Dickel, Simon and Evangelia Kindinger, editors. 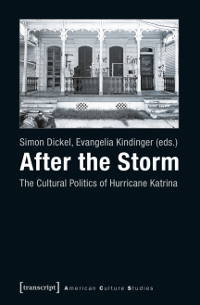 After the Storm: The Cultural Politics of Hurricane Katrina. Bielefeld, transcript, 2015. After the Storm traces the cultural and political responses to Hurricane Katrina. Ever since Katrina hit the Gulf coast in 2005, its devastating consequences for the region, for New Orleans, and the United States have been negotiated in a growing number of cultural productions – among them Spike Lee's documentary film When the Levees Broke, David Simon and Eric Overmyer's TV series Treme, or Natasha Trethewey's poetry collection Beyond Katrina. This book provides interdisciplinary perspectives on these and other approaches to Hurricane Katrina and puts special emphasis on the intersections of the categories race and class. Steinhoff, Heike. 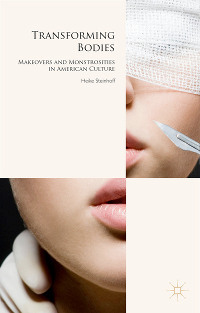 Transforming Bodies: Makeovers and Monstrosities in American Culture. Basingstoke & New York, Palgrave Macmillan, 2015. At the turn of the twenty-first century, American media abound with images and narratives of bodily transformations. Transforming Bodies investigates how these representations have become key sites for the negotiation of power. Focusing on the representations of 'extreme' forms of somatic transformations, particularly cosmetic surgery, this book examines iconic popular cultural texts from diverse media and genres. The reality TV show The Swan, the TV drama series Nip/Tuck, Chuck Palahniuk's (post-)postmodern novels Invisible Monsters and Invisible Monsters Remix, and Scott Westerfeld's young adult fiction series Uglies are read as expressions of the heterogeneous biopolitical discourses that are articulated in the American mediascape. In contemporary American culture, representations of body transformations are often part of a makeover paradigm that presents bodies as 'beautiful,' 'individual' and 'improved' if they adhere to normative constructions of gender, sexuality, class, race/ethnicity, and able-bodiedness. However, Transforming Bodies demonstrates that a number of popular cultural texts take up narrative structures, representational strategies and ideological underpinnings of makeover culture in order to re-write them. These texts link makeovers to images, practices and narratives of monstrosity and thereby challenge cultural norms. At the crossroads of American, cultural, literary, media, gender, queer, disability and governmentality studies, the book presents a timely intervention into critical debates on body transformations and contemporary makeover culture. Vancouver, George. 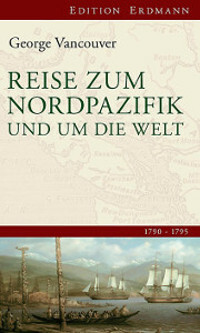 Reise zum Nordpazifik und um die Welt 1791-1795. Edidted by Michael Wala, Wiesbaden, Verlagshaus Römerweg, 2015. George Vancouver (1757–1798) wurde in Norfolk geboren und trat im Alter von 13 Jahren bereits in die Royal Navy ein. Er nahm an James Cooks zweiter Weltumseglung 1772-75 auf der Resolution teil und durchlief während dieser Reise eine Ausbildung zum Midshipman. Auch auf Cooks dritter Weltumseglung 1776 gehörte er, nun bereits Leutnant, mit zur Mannschaft. Bei seiner ersten eigenen Expedition 1791 erforschte er die Pazifikküste Nordamerikas von Kalifornien bis Alaska und Teile der Südsee. Nach ihm wurden zahlreiche Orte benannt: u.a. Vancouver, Fort Vancouver, Vancouver Island. Seine angefertigten Karten von der amerikanischen Nordwestküste waren jahrzehntelang maßgebend. Klemm, Sybille. 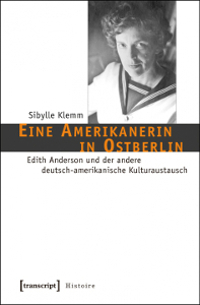 Eine Amerikanerin in Ostberlin: Edith Anderson und der andere deutsch-amerikanische Kulturaustausch. Bielefeld, transcript, 2015. Die außergewöhnliche Biografie Edith Andersons liest sich wie ein Roman des Kalten Krieges. Die Amerikanerin lebte von 1947 bis 1999 in Ostberlin. Als Übersetzerin, Journalistin, Autorin und vor allem als Vermittlerin initiierte und pflegte sie auf vielfältige Weise den kulturellen Austausch zwischen der DDR und den USA. Sibylle Klemms erste ausführliche Untersuchung des Wirkens von Amerikanerinnen und Amerikanern in der DDR zeigt eine andere Seite des Kalten Krieges: Anderson versetzte ihre Umwelt über Systemgrenzen hinweg in produktive Unruhe und scheute sich nicht vor eigenständigen, radikal-kritischen und bisweilen widersprüchlichen Standpunkten - als Amerikanerin, Kommunistin, Jüdin und Feministin. Ogihara-Schuck, Eriko. 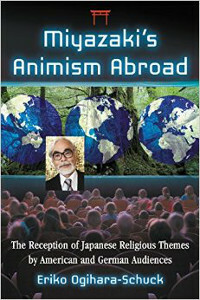 Miyazaki's Animism Abroad: The Reception of Japanese Religious Themes by American and German Audiences. Jefferson, McFarland, 2015. After winning an Oscar for Spirited Away, the Japanese director Hayao Miyazaki's animated films were dubbed into many languages. Some of the films are saturated with religious themes distinctive to Japanese culture. How were these themes, or what Miyazaki describes as "animism," received abroad, especially considering that they are challenging to translate? This book examines how American and German audiences, grounded on Judeo-Christian traditions, responded to the animism in Miyazaki's Nausicaä of the Valley of the Wind (1984), My Neighbor Totoro (1988), Princess Mononoke (1997), Spirited Away (2001), and Ponyo on the Cliff by the Sea (2008). By a close reading of adaptations and film reviews, and a study of transitions in their verbal and visual approaches to animism, this book demonstrates that the American and German receptions transcended the conventional view of an antagonistic relationship between animism and Christianity. With the ability to change their shapes into forms easily accessible to other cultural arenas, the anime films make a significant contribution to inter-religious dialogue in the age of secularization. Kindinger, Evangelia. 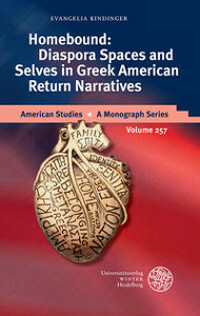 Homebound: Diaspora Spaces and Selves in Greek American Return Narratives. Heidelberg, Winter, 2015. "Home is where the heart is" - but where is the heart of the daughter or the grandson of a Greek immigrant living in the United States? In the American imagination, immigration ends with the successful integration into American culture and society. Yet, the routes of immigration are not straight, but circular. The home outside America appeals to immigrants and their descendants. It inspires them to return and not to stay put. Returnees keep moving back and forth between homes, creating diaspora spaces in which they cultivate transnational ties. In this volume, for the first time, autobiographical accounts of return are conceptualized as a distinct and important sub-genre of travel and life writing, as return narratives. Exemplified by eight Greek American texts about the challenges and benefits of coming home, the motif of return is explored and defined in a diasporic and Greek American context. This motif has played a central role in Greek American writing, especially after the 1960s; it mirrors the complex formulation of a Greek American identity. This volume uses Greek American studies, diaspora theory, transnational studies, and gender studies to offer a new analytical framework in American and Literary Studies for thinking about home, the nation-state and identity today. Hertlein, Saskia. 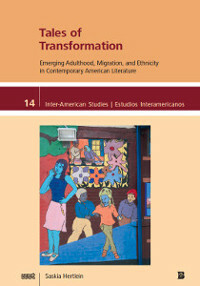 Tales of Transformation: Emerging Adulthood, Migration, and Ethnicity in Contemporary American Fiction. Trier, Wissenschaftlicher Verlag Trier & Tempe, AZ: Bilingual Press, 2014. Contemporary American literature engages with multiple transformations of fictional characters who navigate realms such as age, nation, ethnicity, culture(s), religion(s), and generation(s). This book analyzes eight novels by young female writers in which the protagonists confront the task of charting their place in the world and of dealing with their “emerging adulthood,” a phenomenon that has been studied in the developmental sciences since the beginning of the 21st century. Combining emerging adulthood with other aspects of diversity, this book offers an inclusive perspective for approaching literary engagements with identity and difference that reveals connections beyond common categorizations such as race or ethnicity. Walloth, Christian, Jens Martin Gurr, and J. Alexander Schmidt, editors. Understanding Complex Urban Systems: Multidisciplinary Approaches to Modeling. Berlin, Heidelberg, Springer, 2014. Understanding Complex Urban Systems takes as its point of departure the insight that the challenges of global urbanization and the complexity of urban systems cannot be understood – let alone 'managed' - by sectoral and disciplinary approaches alone. 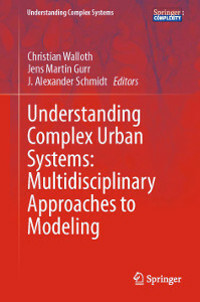 But while there has recently been significant progress in broadening and refining the methodologies for the quantitative modeling of complex urban systems, in deepening the theoretical understanding of cities as complex systems, or in illuminating the implications for urban planning, there is still a lack of well-founded conceptual thinking on the methodological foundations and the strategies of modeling urban complexity across the disciplines. Bringing together experts from the fields of urban and spatial planning, ecology, urban geography, real estate analysis, organizational cybernetics, stochastic optimization, and literary studies, as well as specialists in various systems approaches and in transdisciplinary methodologies of urban analysis, the volume seeks to advance the discussion on multidisciplinary approaches to urban modeling. Raab, Josef, editor. 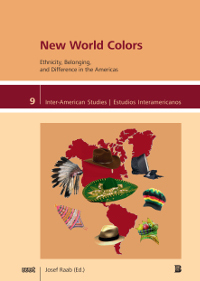 New World Colors: Ethnicity, Belonging, and Difference in the Americas. Trier, Wissenschaftlicher Verlag Trier & Tempe, AZ: Bilingual Press, 2014. Focusing on developments of the past half-century, this volume rediscovers the Amer­i­cas as contested continents. Its twenty essays explore ethnicity, be­long­ing, and difference in sites and contexts located throughout the Western Hemisphere—from Canada and the United States to Bolivia and Chile. They examine methods and motives for construct­ing identities and declaring affiliations in literature and other media, in communities and social movements, in national and transnational scenarios. Baarssen, G.H. Joost. America's True Mother Country? Images of the Dutch in the Second Half of the Nineteenth Century. Münster, Lit Verlag, 2014. 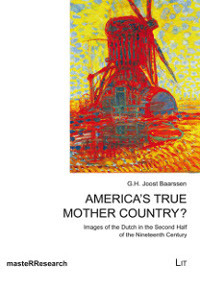 This study analyzes American images of the Dutch since the second half of the nineteenth century. Works by John Lothrop Motley (1814 - 77), Douglas Campbell (1840 - 93) and William Elliot Griffis (1843 - 1928) are explored to assess the transformation in American thinking about the Dutch of the Netherlands and Dutch-Americans. These writers celebrate the Dutch as proto-Americans while using the characteristically American typological approach to history to make sense of themselves and their country. Raab, Josef, Olaf Kaltmeier, and Sebastian Thies, editors. The New Dynamics of Identity Politics in the Americas: Multiculturalism and Beyond. London & New York, Routledge, 2014. Multiculturalism has shaped identity politics in the Americas over the past decades, as illustrated by politics of recognition, affirmative action, and increasing numbers of internationally recognized cultural productions by members of ethnic minorities. Hinting at postcolonial legacies in political rhetoric and practice, multiculturalism has also served as a driving force behind social movements in the Americas. 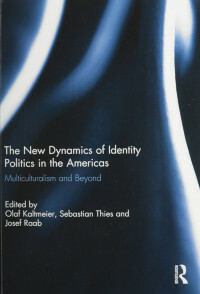 Nevertheless, in current academic discussions and public debates on migration, globalization and identity politics, concepts like new ethnicities, ethnic groupism, creolization, hybridity, mestizaje, diasporas, and "post-ethnicity" articulate positionings that are profoundly changing our understanding of "multiculturalism." Combining theoretical reflections with case studies, the aim of this book is to demonstrate the current dynamics of (post-)multicultural politics in the Americas. Gassert, Philipp and Wala, Michael. Kompaktwissen Geschichte. Weltmacht USA. 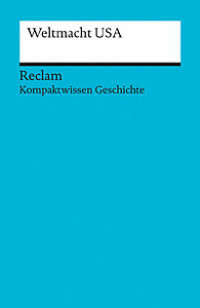 Stuttgart, Reclam, 2014. "Kompaktwissen Geschichte" kann zusätzlich zum Schulbuch eingesetzt werden, oder auch an Stelle der Arbeit mit dem Geschichtsbuch. Die Bände lassen Schülerinnen und Schüler Einblick gewinnen in eine lebendige und dynamische Geschichtswissenschaft. Sie leiten zu eigenständiger Quellenarbeit und so zu selbständigem Geschichtslernen an. Die Autoren der Bände sind Experten für ihr Thema und zumeist jüngere Geschichtslehrer bzw. Lehrerausbilder im Fach Geschichte.